One of the most effective ways to ensure quality early education and protect the health and safety of children is to advocate on their behalf, and we are here to help! Sign up for our weekly legislative update by clicking here. Make sure your email includes your name and agency information. Letting us know what contract types you serve as well will help us customize your communications even further. Download our advocacy guide by clicking on the thumbnail to the right and make an advocacy plan with your agency. Follow our organization on Facebook and Twitter to receive daily updates about issues impacting the ECE community across the State. Click here to watch our Webinar on advocating with Social Media. Join our organization and become apart of a well-informed, passionate group of ECE community leaders! 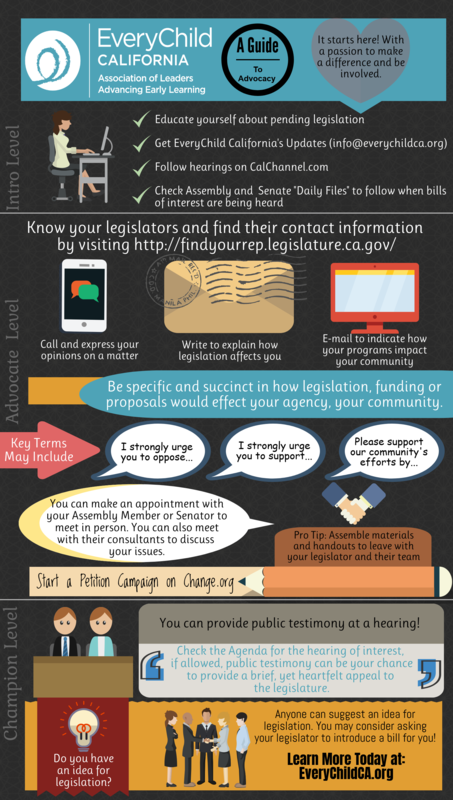 This document illustrates how a bill becomes a law in California. The State of California's Citizen's Guide to the Budget Process, which includes dates, timelines and a glossary is a great resource to the State Budget Process. Find your elected officials and their contact information by clicking here. Phone - You can call your Senator or Assemblymember's office and share your opinion about a bill or an issue that impacts children and families in your community. Once you are connected to the right office, ask to speak to the staff member who works on children's issues. Clearly have in mind your message and request for your legislator. Write a Letter - Elected officials are happy to receive personal letters from constituents, as they know it takes time to write a well-thought out message. Learn more about how to write a compelling letter to your elected officials. Write an Op-Ed - Op-eds are a great advocacy tool and a way to raise awareness about children's issues. They are read by decision makers, opinion leaders and fellow citizens. Learn more about op-eds and how to write one.